Mums and Pumpkins Are In! 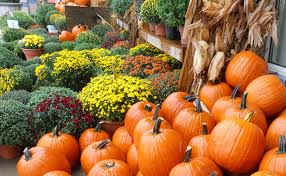 Every Fall, we bring in TRUCKLOADS of beautiful, bright, Autumn-y mums and pumpkins. Since we buy directly from a local Amish farmer and we buy in bulk, we are able to offer the best prices around, GUARANTEED! So if your yard, porch, or house could use a little color this Fall, STOP ON BY!